Play out exciting adventures with this highly posable LEGO® Star Wars Han Solo buildable figure. This impressive galactic smuggler from the Han Solo movie features a large blaster weapon with spring-loaded shooter and hip-mounted, detachable blaster pistol. Star Wars fans of any age will love playing with this young LEGO Han Solo buildable toy. 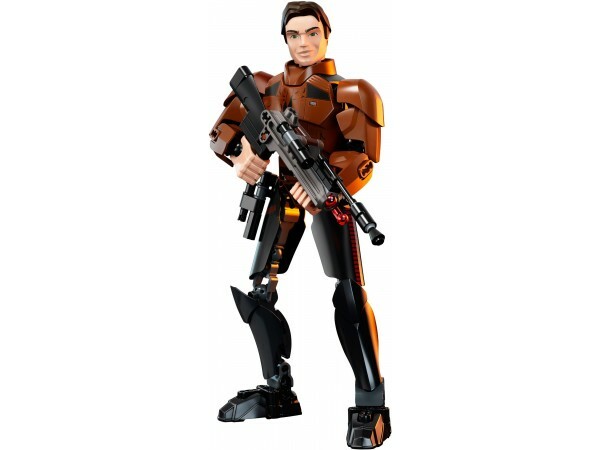 Highly posable Han Solo buildable figure features a large spring-loaded shooter weapon and detachable blaster pistol. Target enemies with the powerful spring-loaded shooter. Play out exciting adventures from the Han Solo movie. This buildable figure is suitable for ages 9-14. Stands over 9” (24cm) tall.